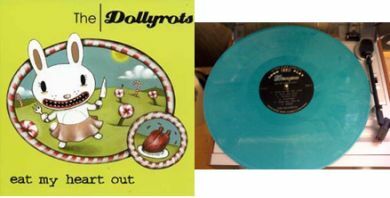 In 2004, The Dollyrots first album "Eat My Heart Out" was released as an LP on Dionysus Records and CD on Lookout / Panic Button Records. The original pressings of both have been unavalible for some time (though there are a handful of copies of the original yellow vinyl LP in the Dionysus cart.) In April of 2010, Dionysus Records in conjunction with The Dollyrots pressed up 500 copies of "Eat My Heart Out" on blue and white opaque vinyl with a download coupon which includes the entire album plus three bonus B sides, just in time for their tour supporting The Buzzcocks. The Dollyrots are inspired by the early '60s Brill Building song-writers and its related girl-group sound of the early '60s with the attitude and attack of The Ramones!